COSCO DEVELOPMENT IS 100 FEET LONGER THAT THE USNAVY’S NEWEST AIRCRAFT CARRIER: It's bigger than any containership to call The Port of Virginia and the US East Coast. 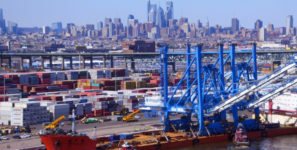 The big-ship era has arrived at US east coast ports. Nearly 2,000 containers will be loaded and unloaded during COSCO Development's stay in Virginia. Virginia port is investing $670 million investment to increase throughput capacity 40 percent by 2020. At 1,200 feet long and 158 feet wide, the containership COSCO Development is a behemoth. It is 100-plus feet longer that the United States Navy’s newest aircraft carrier, the Gerald R. Ford, and is bigger than any containership to call The Port of Virginia and the US East Coast. The vessel can carry 13,092 twenty-foot equivalent units, or TEUs. The previous record was held by the MOL Benefactor when it sailed to Norfolk International Terminals (NIT) last summer. By comparison, Monday’s arrival of the COSCO Development breaks the previous record by 3,000 TEUs. Tugboats eased the COSCO Development alongside at Virginia International Gateway (VIG) on Monday morning. Soon after, crews descended on the berth, climbed into the ship-to-shore cranes and shuttle trucks and began the process of loading and unloading. During the course of her 30-plus hour stay in Virginia, multiple labor shifts will load and unload nearly 2,000 containers. On average, most vessels are in port for 12 to 14 hours. “What’s truly significant is that Virginia is this vessel’s first East Coast stop,” Reinhart said. “This vessel is taking full advantage of our 50-foot channels and an expanded Panama Canal. As the ships get bigger there are corresponding cargo loads. So our ability to quickly push these slugs of cargo inland by barge to Richmond Marine Terminal and double-stack rail to Virginia Inland Port and then into our markets in the nation’s heartland becomes even more important. COSCO Shipping is part of the OCEAN Alliance, a group of ocean carriers that also includes CMA-CGM, Evergreen Line, and OOCL. Alliance members agree to contribute ships and share space on those vessels. The vessel is in the alliance’s South Atlantic Express service and it came to The Port of Virginia via the Panama Canal. In this weekly Asia-to-US East Coast service there are 11 vessels ranging in size from 11,000 to 13,000 TEUs. The port rotation includes Hong Kong, Yantian, Ningbo, Shanghai, Panama, Virginia, Georgia and South Carolina and then back to China. Reinhart said the growing vessels sizes and accompanying cargo volumes are behind the port’s $670 million investment to increase overall annual throughput capacity by 40 percent – one-million containers – by 2020. Presently, heavy construction is underway at VIG and the civil engineering work is nearing its start at NIT. “We are adding capacity now so we can handle the cargo that will be coming to us on these vessels,” Reinhart said. “The big ships are here — more are on the way – and they are carrying significant amounts of containers. In order to be sustainable and competitive for decades to come, we must be ready to accommodate that volume at our inland and water-side facilities.